One of the things I am very lucky to have is support. My family is super supportive of my passion for fitness, losing weight, and my fanatical love of half marathons. My mom has accompanied me on every half marathon (even when I put her in matching costumes) and personal training session. My husband has been supportive of all my training, helping roll out my muscles, and he has embraced our changed diet. In the early years of me trying to change, I had toxic friends around me. I know I was the “fat friend.” The one they always thought well at least I’m not THAT big. Unfortunately, it took too long to realize they weren’t ever going to get on board with me changing. They were the people who insisted you needed to eat ice cream, cake, and candy because they wanted to. When I got them out of my life, it was amazing how much easier it was for me to workout and stick to my plan. I believe a great support system is one of those keys to successful weight loss. If you feel everyone is constantly trying to sabotage you, or talk you out of the workout, it’s going to be harder to succeed. 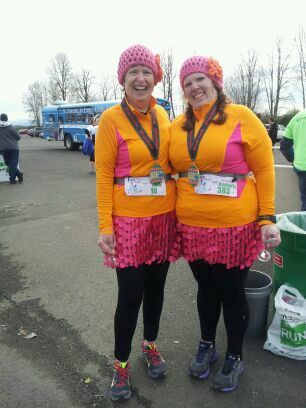 This is my mom and I after out latest half marathon, Hop Hop Half, it was Easter themed and had brunch with mimosas at the end. The skirts and hats were made by me, the sassy coordinating tops bought at the fabu Target! Great post! You are my hero.